I always have two wooden shelves in our cages and that is in addition to the ledges. We use pine and they run from front to back and are 10" wide. I put one on each side of the cage. This gives the chins a solid place to play on and sit. They also chew the edges of the shelf of course. 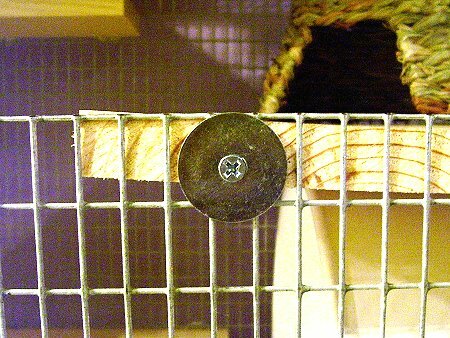 You attach the shelf with fender washers and wood screws (as shown). As long as you have a way to cut the wood to size, you can easily make your own shelves. You can pick up kiln dried pine at any Lowe's or Home Depot.